Our American Alps Solid Wood Gun Cabinet is a beautiful example of quality American made craftsmanship and is handcrafted to hold up to 8 of your best rifles or shotguns. Choose from top quality oak, brown maple, or cherry woods, as well as a wide variety of stain and finish options to create a custom look for this beautifully handcrafted wood gun cabinet. We also offer custom options if you are looking for something specific to fit your gun storage needs. The standard double strength glass doors come with secure locks to restrict access to your firearms and to prevent them from being stolen. 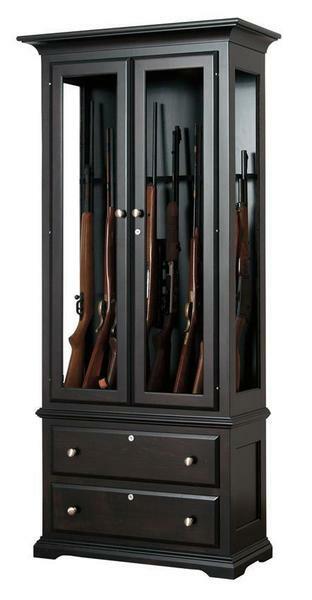 Add some additional safety to your gun cabinet by upgrading to tempered glass doors. The bottom drawers also comes standard with secure locks, making them the perfect storage area for your ammo, hand guns, and firearm accessories. At DutchCrafters we have a wide variety of ways to display your guns safely inside our beautiful Amish gun cabinets. You can choose from this beautiful style shown, as well as our large Collectors Edition 25 Gun Cabinet, Hidden Gun Cabinets, Corner Gun Cabinets, Gun Cabinets with Carousels, and plenty of custom options to help you create the perfect piece for your gun storage needs. Contact one of our Amish furniture specialists today for additional information, ordering assistance, or for a custom gun cabinet quote. This solid wood American Alps Gun Cabinet is sure to become a family heirloom that is passed on for generations. Received it this morning. Lonnie of Beiler Transport was very professional, helpful, & courteous. Thank you! I hope my husband will love it when he comes home!